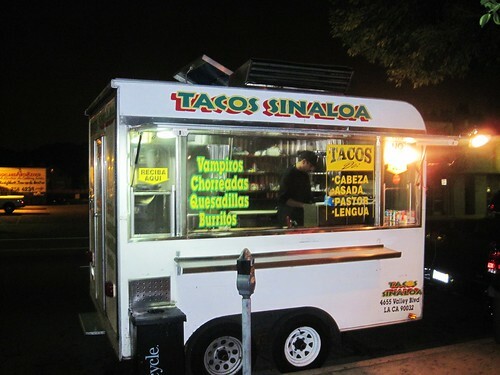 I had heard of Tacos Sinaloa before but when I was told they were on twitter I had to head out to Highland Park and try the tacos. It was worth the drive, the tacos were excellent. The tacos are nicely balanced - a mild avocado salsa and salsa roja on top of well seasoned meats. You get a good mix of flavor with each bite - the coolness of the avocado salsa matching wits with the spiced al pastor. 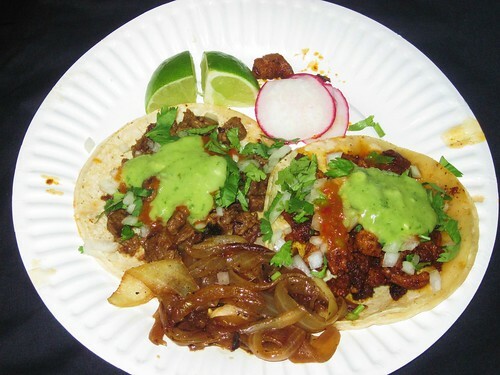 The al pastor is not cut from a vertical spit but one can tell it has been carefully prepared and well marinated. The side of grilled onions are a nice compliment. Carne asada is on point as well. On this taco the avocado salsa has more to say without the spice from the al pastor vying for attention. The beef is subtle and you can really taste the more complex flavors of the salsas. If you want something a little more hearty order a vampiro, a crispy corn tortilla topped with meat, cheese and salsa or if you have the appetite order the chorreada , a traditional Costa Rican antojito made from pancake and stuffed with meat or potato and cheese filling. Tacos are a deal at $1 each and with all the competition in Highland Park these tacos rank right up there with the best of them. 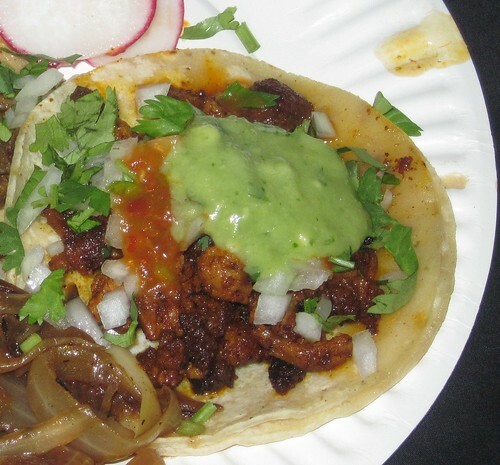 If you want a taco with a shot of spicy salsa roja you may want to head to La Estrella or El Pique on York but for maximum flavor and for lovers of avocado salsa it’s Tacos Sinaloa. their twitter says they've moved to bakersfield?! I'm going to have to try this truck out. I'll find out how they rank against the Bakersfield standard, Tacos de Huicho. Hola....Mi nombre es Brianda Elena Peraza Noriega, soy de Mazatlán, Sinaloa y me gustaría saber si tienes algún correo electrónico donde pudiera contactarte? Lo que pasa es que me encuentro realizando un proyecto doctoral sobre los pequeños empresarios mexicanos en Los Ángeles. Pudieras enviarme tu dirección de correo electrónico? Para hablarte más de mi proyecto de tesis. Doctorado en Estudios del Desarrollo. for you if it's allright. Is it simply me or does it seem like some of these comments come across like left by brain dead individuals? :-P And, if you are posting on additional online sites, I would like to follow everything fresh you have to post. Could you list of every one of your social pages like your linkedin profile, Facebook page or twitter feed?